Star Wars Battlefront is a team-based game, and thus a certain amount of coordination is paramount to success. A well-organized team is always going to fare better than a bunch of hot-headed random goofs with guns, after all, which is why the Empire was able to so easily handle the smuggler, the farm boy, the old coot, and Upright Lassie when they tried to save the princess from the most heavily-armed battlestation the galaxy has ever seen. It thus came as something of a surprise to learn that the game will not have integrated support for voice chat. "You can choose your favorite third party software to communicate with friends on PC," EA tweeted in response to an inquiry about voice chat. The PS4 and Xbox One versions, for those curious, will utilize their "built-in party system for in-game chat." Practically speaking, it's not really a big deal. Gamers who want to talk to their fellow players have various options at their disposal, and Origin itself supports it, although I believe that's only good for people in your friends list. I suppose it's the principle of the thing that rubs me the wrong way. 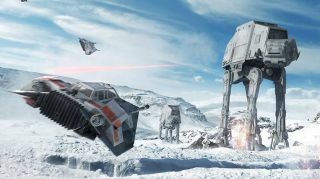 Star Wars Battlefront is the very definition of a big-budget game, so why is a fundamental feature being overlooked? This is really more of an FYI than an OMG, but how do you feel about it? Is integrated voice chat a feature that should have been included, or is it something better left to separate, dedicated software? The Star Wars Battlefront beta is now over, by the way, so anyone hoping to get in a few more rounds on Hoth (as I was) will have to wait for the full release of the game on November 17.